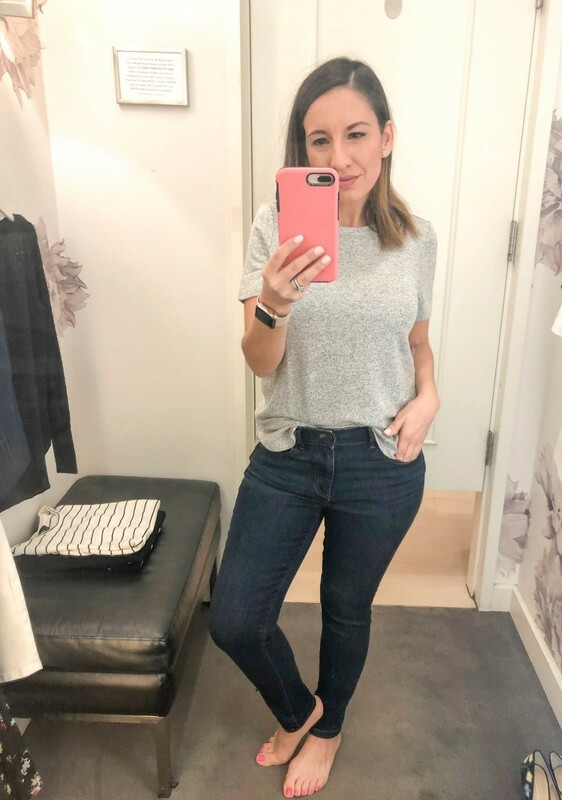 Last Thursday I stopped by Ann Taylor to do a little shopping and find some cute spring/summer essentials. I wanted to share this earlier but life got in the way. So I am sharing everything I found on here and also sharing it on Instagram stories. That way you can see photos and videos of how everything looks too. It will have its own highlight (It’ll be under Ann Taylor Try-on Session. This will be up no later than Monday.) on there. I am happy to report my shopping trip did not disappoint. Almost everything was so good. 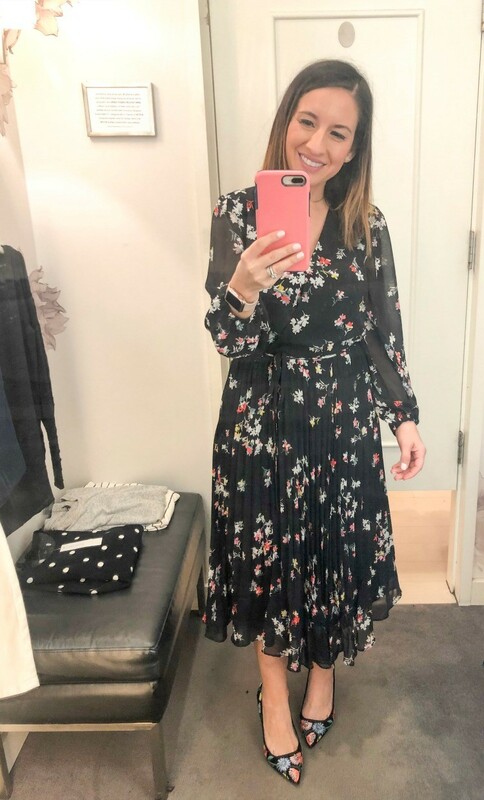 Heads up Ann Taylor is giving 50% off until the 25th with the code SPRINGTOIT. Let’s chat about this top that is technically called a tee. It is so much more than a tee. It has seriously the best weight to the top and feels so luxurious. It is such good quality. I would get it in every color available if I could. 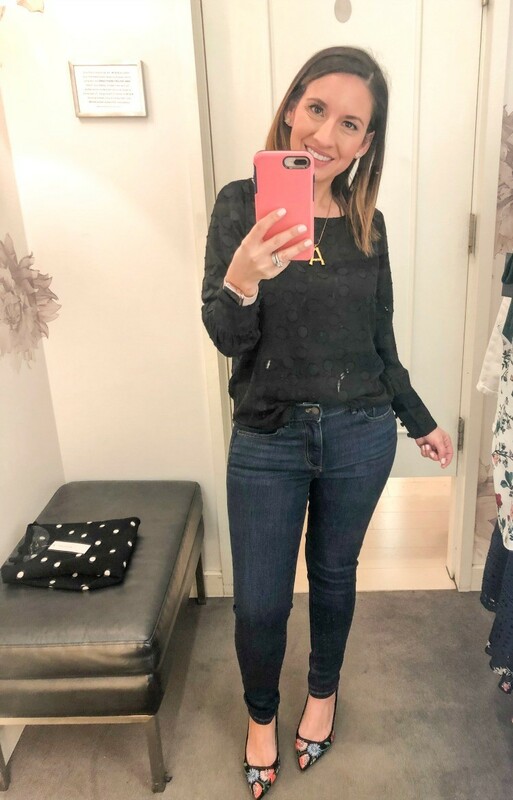 Funny story about these cute jeans. So I was totally drawn to them as soon as I saw them in the store. Well after trying them on I was like these fit like the other pair of jeans I love from here. So long story short they are legit the same pair I bought a few months ago. Hehe!! Oh well, I now have two pairs of them and I am not even mad about it. This skirt screams spring/summer. 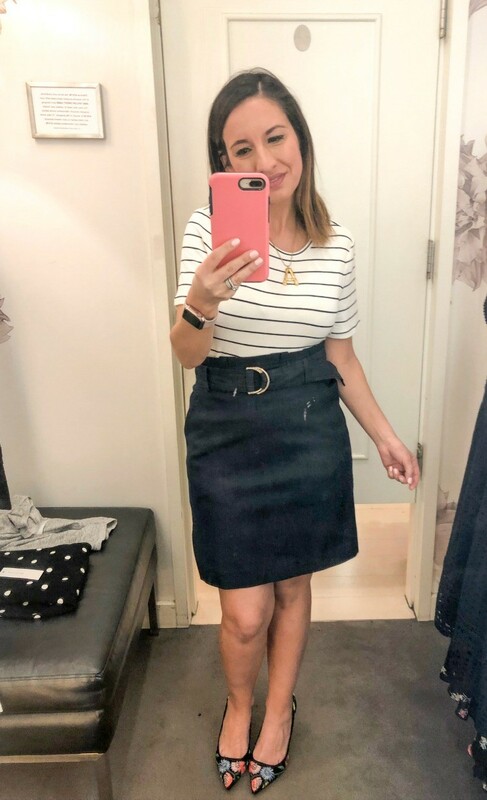 This has is one of those great skirts that you can wear as a casual outfit with a T-Shirt and some slip-ons or with some heels. 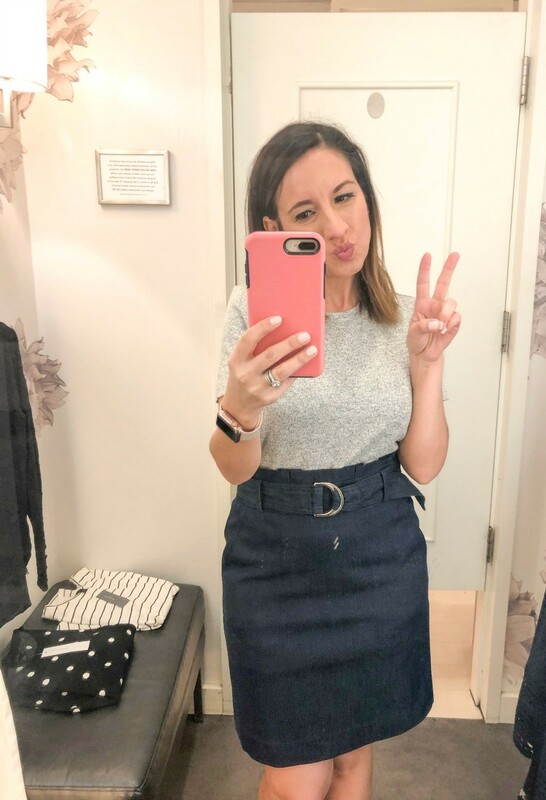 The skirt runs true to size (tts) and is really good quality. The fabric has a really good weight to it. This is another top that is technically categorized as a tee but is so much more than a tee. First, it is basically the perfect weight. Not too heavy and not so lightweight that you feel like it won’t last. It’s also a great basic. 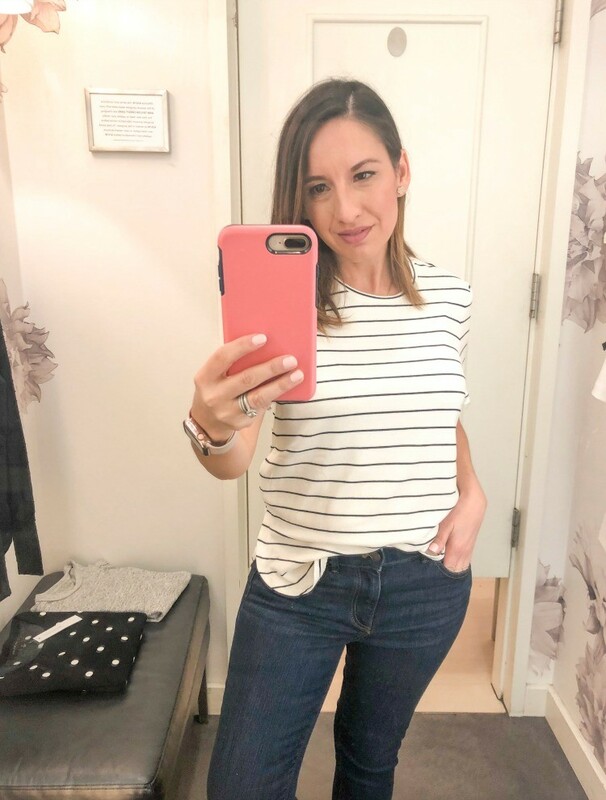 My motto is you can never have enough cute stripe tees. I think they are a closet staple. It runs tts. This is one of those dresses you need. It has the perfect on-trend details without being too trendy. Also, it is basically the perfect length. It runs tts and is even prettier in person. The pictures don’t do it justice. 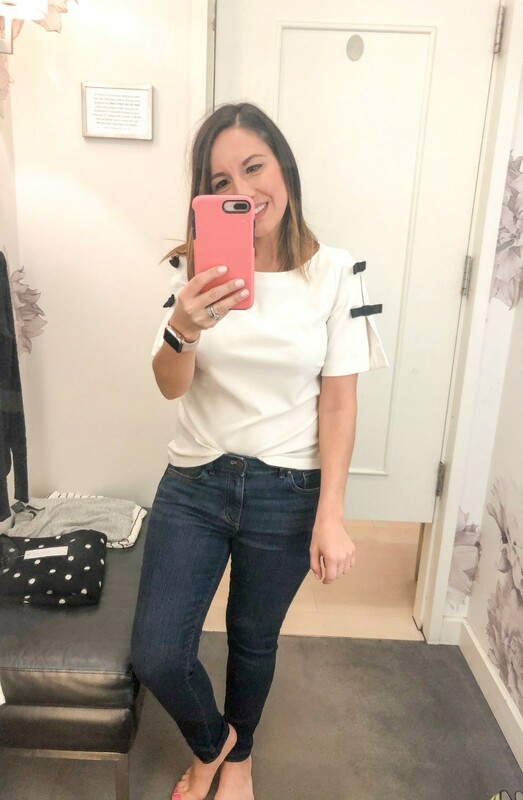 This bow sleeve top is one of my favorites that I tried on. It has the little slits on the sleeves and I love these understated bows. 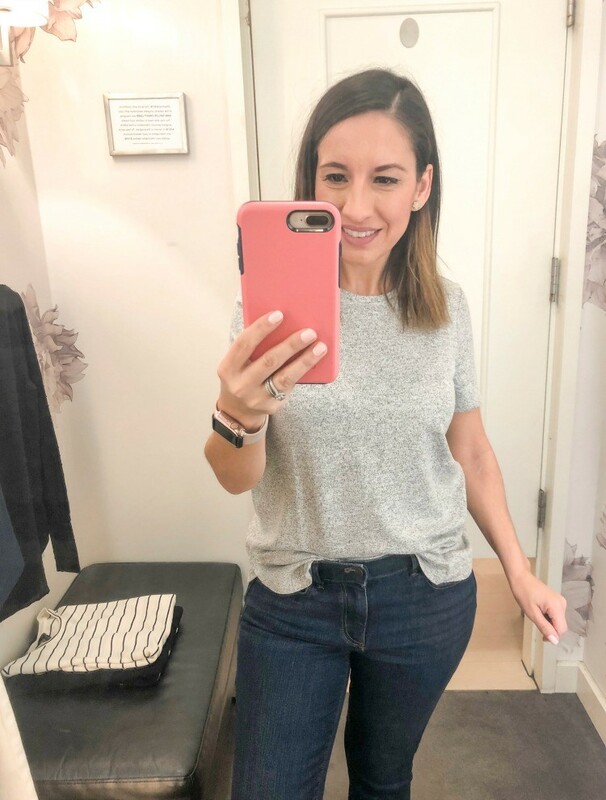 It makes it perfect to wear as work wear or casual the way I did with these jeans. It runs tts. By the way, these are the same jeans as above that I realized after the fact I already have. Let me start by saying this top looks good with everything. 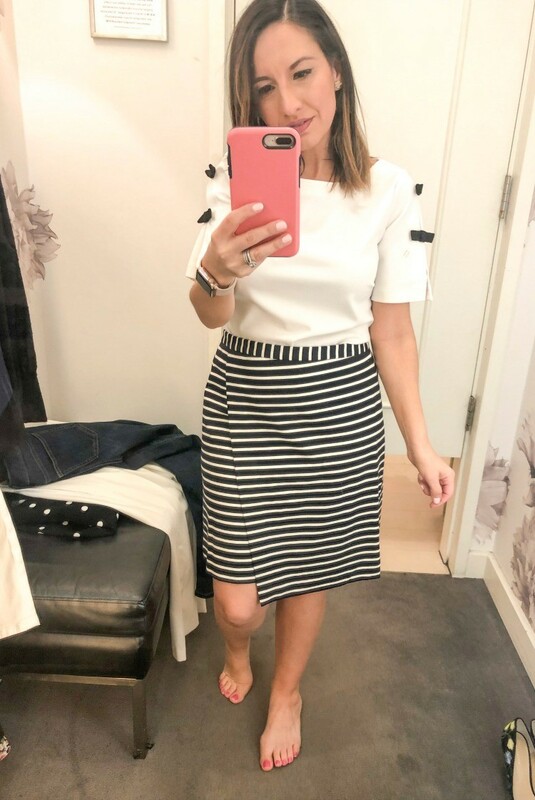 I love the stripes and it is definitely one of those staple pieces we all need. I promise. It runs tts by the way. 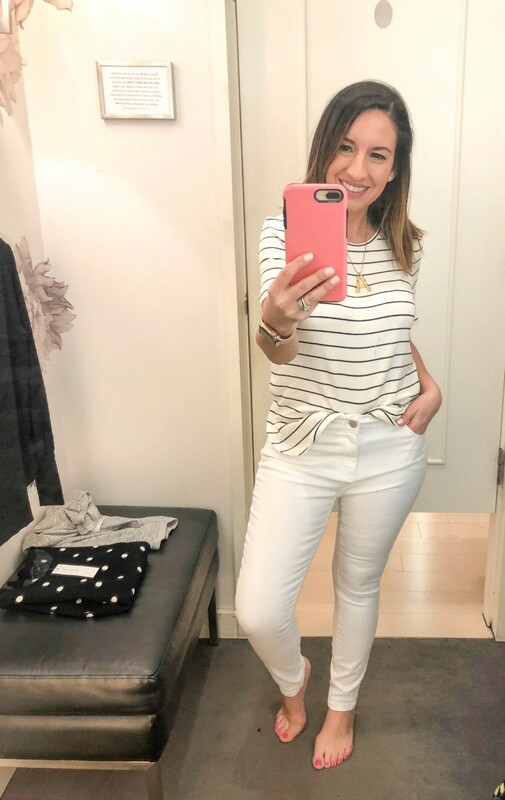 I had high hopes for these white jeans but they just aren’t great. They had wrinkles at the crotch area and just didn’t seem smooth. I tried on a few sizes but sizing up and down didn’t work. The fabric of these jeans was also too thin. I would have to be really careful with the color of underwear I wore with these. These sadly were a hard no. I did find another pair that I really want to try. Here they are just in case you’re curious. They look so good and come in both regular and petite sizing. 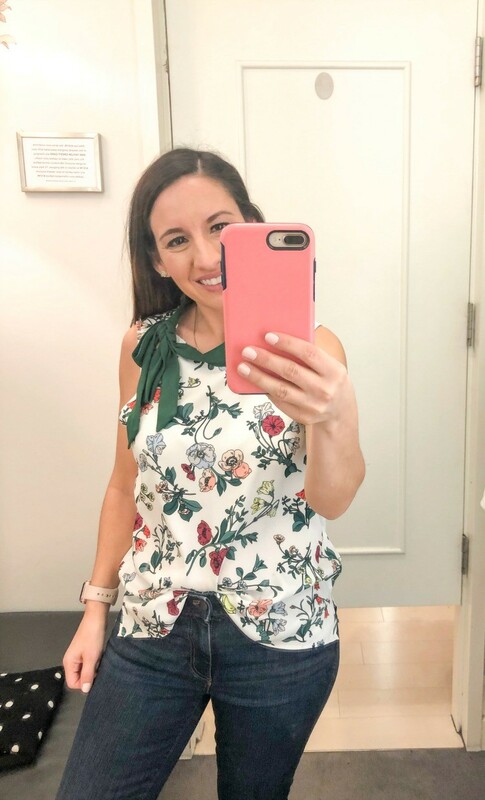 This blouse is one of my favorite things I tried on. It might not give you the spring vibes at first but it is the perfect weight for sping/summer and transitioning into fall with a blazer (Love this light pink version. It’s so perfect! ).For spring and summer just add a bright statement earring. I don’t know where to start because I love everything about this blouse/outfit. First I love that this top is chiffon with the perfect clip dot pattern. Plus the boat neck detail is just up my alley. It gives enough room to wear a delicate necklace or a statement one like the one I wore for this try on session. Plus I love the button details on both cuffs. Basically, blouses like this are my love language. I went with the jeans I shared with y’all earlier. Oh and I almost forgot these gorgeous floral heels. They are so comfortable and cute. Something you have to know about Ann Taylor heels is they are some of the most comfortable shoes I have EVER worn. Like Ever. Everything runs tts. I talked about this tee earlier so you basically know I love this tee and wish I could have it in every color. It runs tts and fits like a dream. Now let’s talk about this super cute jean skirt. It is definitely more refined than your run of the mill jean skirt. I love the faux paper bag waist detail and the cute belt. It’s also lined so all you feel is a super soft slip that is attached to the skirt. It also has the perfect faux pockets as well. I wanted to share the full skirt with you. I would probably pair it with a summery heel or pair of heeled sandals. Though technically these heels could go with a jean skirt since this is the one time mixing black and blue is totally fine in my book. This dress is gorgeous. The photos don’t do it justice but it is so pretty. It is the perfect length for a date night or get-togethers with friends. Also, it has the most perfect sheer long sleeves. Which is great if you want a breathable long sleeve or are a little self-conscious about your arms. This shares a little without feeling too dark or heavy for spring/summer. It’s a faux wrap and is perfect for all my nursing mommas. 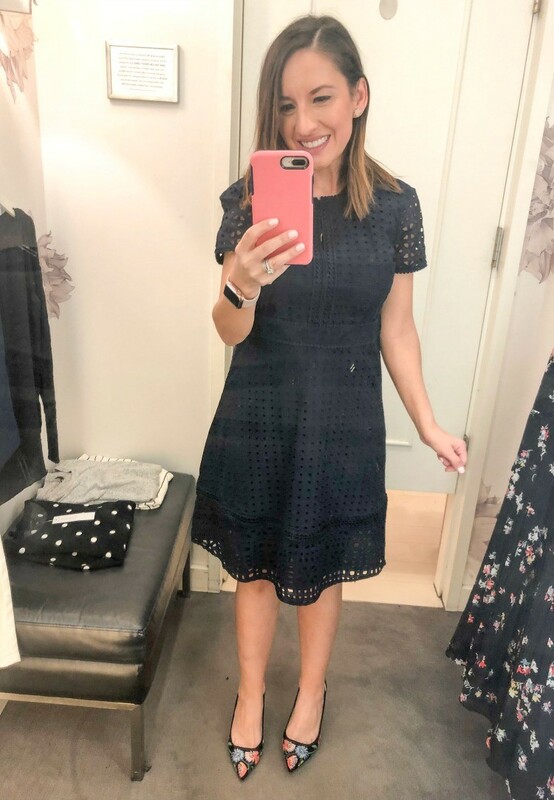 I probably wouldn’t go with these heels but this dress needed to be shared with a heel. If I was to wear it I would probably wear these heels. Let me start by saying this is such a good top for so many people. Unfortunately, it isn’t a good fit for me because I couldn’t find one that was just the right size around my neck. That’s why the bow on this top is hanging a little bit awkward. This is a bow that can’t be adjusted which has its good points. It’s a bow that always looks perfectly tied. The other thing I love is the pretty bright floral pattern. Since it is on sale till the 25th I am debating ordering it and taking it to my seamstress. I know she could make it fit my neck just right. All in all, I have to say my trip to Ann Taylor was a pretty big success. I found so many good things and from doing this post I have found a few more that I want. For the next two days, Ann Taylor is giving 50% off plus free shipping with the code SPRINGTOIT.